Defender-Pro™ Epoxy Truck Bed Liner with Kevlar®. Ultimate bare metal adhesion. Ultimate chemical resistance. Ultimate durability. Ultimate ease. 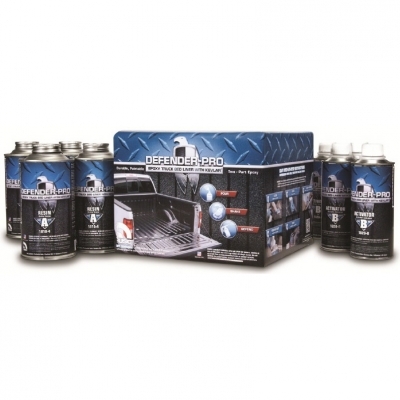 Defender-Pro’s advanced, two-part, epoxy formula is designed to save time and money. Simply pour, shake and spray your way to a beautiful, durable finish in less than 20 minutes (excluding prep time). · Includes a FREE APPLICATOR GUN inside specially marked kits and while supplies last. Kevlar® is the registered trademark for a para-aramid synthetic fiber. Developed in 1965, this high strength material was first commercially used in the early 1970s as a replacement for steel in racing tires. Typically it is spun into ropes or fabric sheets that can be used as such or as an ingredient in composite material components. Currently, Kevlar® has many applications, ranging from bicycle tires and racing sails to body armor because of its high tensile strength-to-weight ratio; by this measure it is 5 times stronger than steel on an equal weight basis. It is also used to make modern drumheads that withstand high impact. When used as a woven material, it is suitable for mooring lines and other underwater applications. NOTES: Kevlar® is a registered trademark of E.I. du Pont de Nemours and Company.